Ford helped organize the national organization’s sixth hearing on quality education, which took place in the Crescent City on April 6. What was described as a forum to “discuss the impact of charters on underfunded districts, sustainability of public education, increased accountability and transparency,” according to a press release, actually became an unorganized venting session largely decrying the injustices of charter schools, Teach for America and the firing of teachers post-Katrina. A seven-city tour emerged in the wake of the NAACP board resolution last year that called for a countrywide moratorium on charter school expansions, which received significant pushback (pdf) from pro-charter advocacy groups and school leaders. With nearly all of New Orleans’ public school students attending charter schools, the NAACP’s visit to the Crescent City posed an opportunity for the historic civil rights organization and other cities to learn about the successes and trade-offs of an all-charter district, possibly too unusual a case from which to draw suggestions. New Orleans is currently the only large school district in the country in which nearly all of its public school students attend charter schools. But the hearing gave New Orleans yet another opportunity to express the pain from an apparently still open wound inflicted in the wake of Hurricane Katrina. The NAACP invited five presenters apiece to argue for and against the NAACP resolution. The crowd of approximately 250 attendees, mostly black, overwhelmingly sided with presenters who supported the resolution, which, from the consistent pattern of boos and hisses, translated to being against charter schools. With the exception of invited speakers, current educators from the all-charter district were conspicuously absent. Still, clear differences arose from the back-and-forth of invited experts. However, the expert testimony of Willie Zanders reflected the main temperature of the room. Zanders was the lead attorney for the seven plaintiffs who sued the state on behalf of the 7,500 employees fired by the Orleans Parish School Board in the aftermath of Hurricane Katrina. The crowd’s reaction to his presentation made it clear that there were former employees among the attendees. 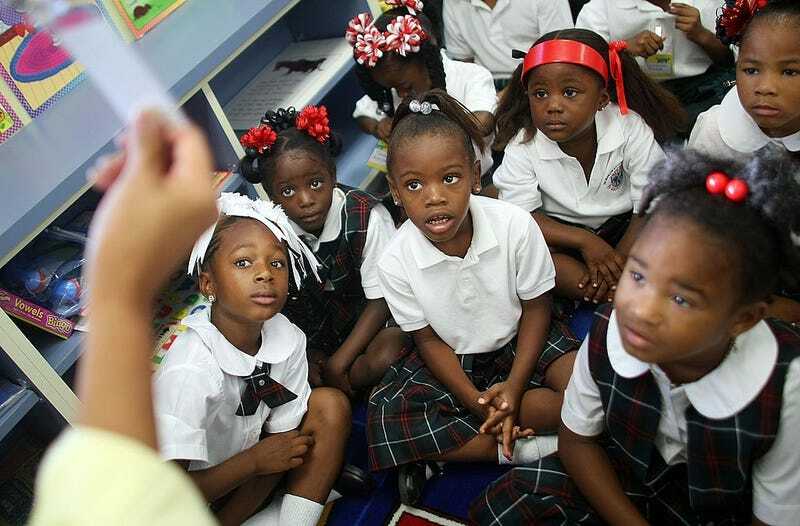 In 2004-2005, 71 percent of teachers in New Orleans were African American. By 2014, this figured had dropped to 49 percent. This decrease is equivalent to about 4 percent of the entire African-American working-age population. After earlier favorable rulings, the Louisiana Supreme Court ultimately dismissed the suit in October 2015. Frustrations eventually boiled over among the largely anti-charter crowd, which would not be silenced either by New Orleans NAACP President Gloria Hall-Johnson, who chaired the meeting, or by the chair of the NAACP’s National Task Force for Quality Education, Alice Huffman. During the public comment section, which allotted two minutes per speaker, a parent of charter school graduates who identified herself as Nikki, “the whistle-blower parent,” demonstrated the repeated concern about Teach for America teachers. Nikki testified that her children did not receive a consistent education because they were taught by several itinerate Teach for America teachers. She sought assistance from the local NAACP chapter, which she said did not respond to her complaints at the time. “I want to go on record and say, I do not trust the NAACP,” she said. “Your comment just illustrated why I don’t trust you,” Nikki replied. Huffman then countered, “If you don’t want us here, we can leave.” A collective groan washed over the room. The two-minute restriction for testimony was thrown to the wind, and people who did not fill out comment cards approached the dais. The angry crowd briefly broke out in song; “Ain’t Gonna Let Nobody Turn Me Around” could be heard as students from the nonprofit youth advocacy group Rethink took control of the podium. “This is about us, so why can’t we speak?” asked one youth as she stood firmly at the podium with three other school-age children. After an exchange with the chair, the students were asked to testify. “My testimony is, you’re not there every day. You don’t come down [to] the school to see what happens every day,” said another girl who attends a charter school. In the beginning of the meeting, Huffman explained, “This is just a hearing to get information.” But the NAACP learned that there is a lot of pain associated with past reforms. Hearings have taken place in New Haven, Conn.; Orlando, Fla.; Memphis, Tenn.; Los Angeles; and Detroit. The next hearing is scheduled for New York City on April 27.